During Holy Week the Church lives again the passion and death of Christ. On the first day, Palm Sunday, the solemn entry of Jesus into Jerusalem is celebrated by the blessing of palms, followed by a solemn procession. At the Mass of this day, as on Tuesday, Wednesday, and Friday, the story of the Passion from each Evangelist is read. 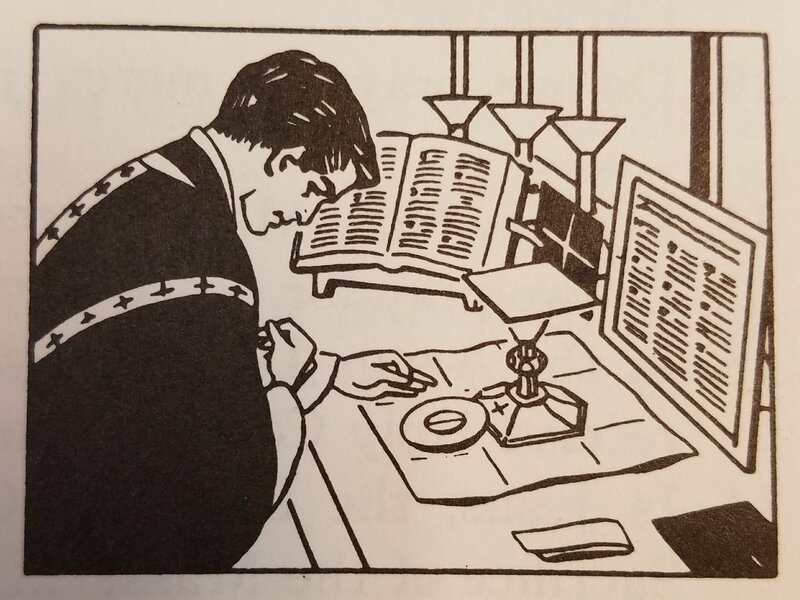 On Thursday, Friday, and Saturday of Holy Week the Tenebrae are celebrated: the fifteen candles are put out one by one, to symbolize the flight of the disciples, and the death of Our Lord. On Holy Thursday morning a pontifical Mass is celebrated, in cathedrals only; at this the holy oils are blessed. Commemorating the Last Supper at which the Holy Eucharist and the Priesthood were instituted, Holy Thursday Mass takes place in the evening, with the washing of feet to commemorate Christ’s washing of the Apostles’ feet. At the Good Friday service, emphasis is given to the veneration of the cross. Holy Saturday services are held at night, beginning with the blessing of the new fire; from this the Paschal candle is lighted, a reminder of Christ, Light of the world. The five grains of incense imbedded in the candle remind us of His wounds. Four Lessons are read; the baptismal water is blessed and taken to the font. The Mass commemorates, Our Lord’s glorious Resurrection. When did Christ die? –Christ died on Good Friday. Where did Christ die? –Christ died on Golgotha, a place outside the city of Jerusalem. Christ was crucified on a hill called Calvary, outside the city of Jerusalem. St. Augustine says that on the cross Our Lord bent His head to kiss us, extended His arms to embrace us, and opened His heart to love us. How thankful we should be to Christ for His love! “He humbled himself, becoming obedient to death, even to death on a cross” (Phil. 2:8). What took place at the death of Christ? –At the death of Christ the sun was darkened, the earth quaked, the veil of the Temple was rent, the rocks split, and many of the dead arose and appeared in Jerusalem. The tearing of the veil of the Temple at the death of Christ marked the endof the Jewish religion as the true religion. This Jewish religion had been a figure of the True Church, and when the Church was established, was no longer needed: types and figures had to give way to reality. The veil of the Temple concealed the Holy of Holies, the most sacred part of the Temple. We must not, however, make the mistake of thinking that Christianity ended the moral laws-laws regarding good and evil that were taught by the Jewish religion. Christ came not to destroy, but to perfect, the Old Law. The authority of the Temple and its officers was now placed in the Church established by Christ, in the hands of His Apostles. The ceremonial laws of the Jews relating to worship were abolished. The Church commemorates the passion and death of Christ on Good Friday. The solemn afternoon service consists of four parts, the veneration of the cross being the chief feature. All may receive Communion. After the Holy Thursday ceremonies the altar was stripped; lights were put out, and bells silenced. After His death, Our Lord’s body was taken down from the cross and laid in the grave which belonged to Joseph of Arimathea. Then His disciples rolled up a great stone to close the tomb. What do we learn from the sufferings and death of Christ? –From the sufferings and death of Christ we learn God’s love for man and the evil of sin, for which God, who is all-just, demands such great satisfaction. It was not necessary for Jesus to suffer so intensely in order to redeem all men. As His merits are infinite, He could have wiped away the sins of a thousand worlds by shedding one drop of His blood. But He chose to suffer agonies because He loves us. “Greater love than this no one has, that one lay down his life for his friends” (John 15:13). “I am the good shepherd. The good shepherd lays down his life for his sheep … I am the good shepherd; and I know mine and mine know me. … and I lay down my life for my sheep” (John 10:11-15). From the Passion of Christ we learn the evil that sin is, and the hatred that God bears it. We learn the necessity of satisfying for the malice and wickedness that is sin. Sin must be a horrible thing, to make Jesus Christ the God-man suffer so much. By Christ’s obedience He atoned for Adam’s disobedience, for He was obedient unto death. “He was wounded for our iniquities; he was bruised for our sins” (Is. 53:5). The sufferings of Christ, in addition, serve as an example for us, to strengthen us under trials. Christ gave us an example of patience and strength. If we receive trials, we should accept them with resignation, in imitation of Our Lord, Who suffered so willingly for our sake. We can never have as much suffering as He did. Churches are built in the form of a cross because within the sacrifice of the cross is reenacted. Within them we remember easily the events that took place that day long ago, when Jesus Christ, Son of God, for love of us suffered and died on the Cross. Church spires lead us to “seek those things that are above” (Col. 3:1); they are surmounted by a cross, the symbol of our salvation; their bells call us to prayer, communion with God. The church interior is divided into three parts: the porch, where in former times those preparing for baptism and the penitents knelt; the nave, which is the central and main portion, for those attending the Holy Sacrifice; and the choir or sanctuary, where in former times the singers stayed, now reserved for the clergy, and separated from the nave by the communion rail.